Kingston Technology Company today announced the immediate availability of its new DataTraveler Secure – Privacy edition, a USB Flash drive designed specifically to meet enterprise-level security and compliance requirements. 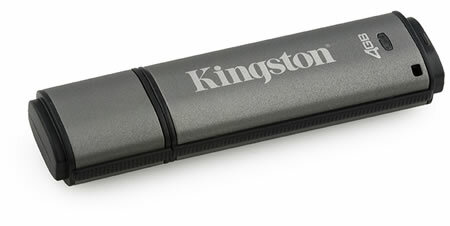 The Kingston DataTraveler Secure – Privacy edition is the world’s first USB Flash drive that secures 100 percent of data on-the-fly via 256-bit hardware-based AES encryption, ensuring fail-safe security best practices. Featuring a complex password protocol and a mechanism that locks out would-be attackers after 10 consecutive failed password attempts, the Data Traveler Secure – Privacy drives remove the onus on employees to protect their information. The new Kingston drives feature titanium-coated stainless steel casings to withstand harsh working environments and operating conditions and are waterproof rated– even in the event of submergence in depths up to 4 feet. Slightly larger than a five-stick pack of chewing gum, the Kingston DataTraveler Secure – Privacy edition drive offers superior performance, with read and write speeds of up to 24 MB/sec. and 10 MB/sec. respectively; and are available in storage capacities up to 4 GB. Pricing for the drives start at $53 (512MB).